‘Adud al-Dawla was the first Buyid ruler to set in the stones of Persepolis a reminder of his presence, in 344/955. Some time later, his third son, Baha’ al-Dawla, did the same. Is it plausible to speak about a tradition in the case of Buyid graffiti? Maybe it is. This tradition seems to have started with ‘Adud al-Dawla, the ruler of the Buyid apogee. His son and heir, Baha’ al-Dawla kept on with this tradition, recording on the ancient stones of Persepolis his presence. 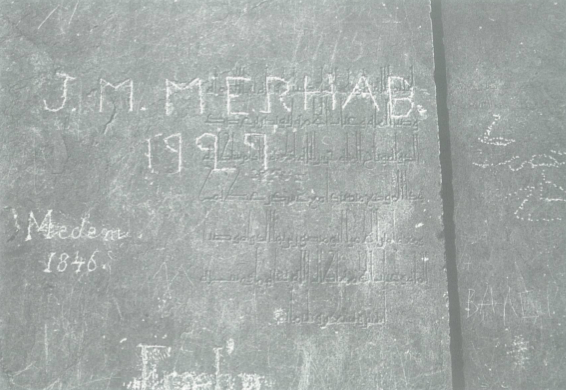 Both of them, the father and the son, used these graffiti mainly to state their presence in Persepolis, that, as I have already mentioned, is strictly connected with the Sasanian past of Iran: the Buyid graffiti were a clear claim to their Sasanian descent. The volume by Prudence O. Harper on Sasanian art is titled The royal hunter: Art of the Sasanian empire. 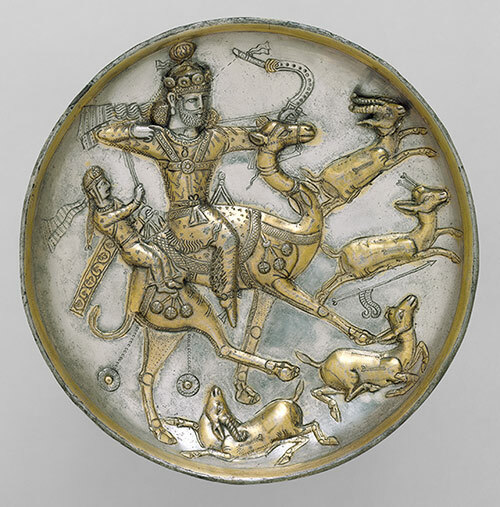 In another volume of the same author, Silver Vessels of the Sasanian Period: Royal imagery, it is made clear that the ‘royal hunter’ became “the most common motif on the silver plates” of the Sasanian dynasty around the second half of the 4th century (p. 126). The motif was chosen most probably as it was a visual representation of the Zoroastrian system of thoughts and believes. In fact, in the figural arts of the Sasanian period, there is little that can be considered specifically Zoroastrian, but the images represented bear a Zoroastrian underground: the theme of the contest, with humans hunting for instance, is related to the Zoroastrian eschatology and the cosmic struggle between the spirits of good and evil (The Royal Hunter, pp. 14-15). It is of course plausible that Baha’ al-Dawla was actually hunting, and that the inscription is recording a real fact. But it is also plausible that Baha’ al-Dawla was not hunting at all that day of the year 392/1001-1002. Taking into account the iconographic tradition of the Sasanian empire and the representation of the king-hunter as a symbol of royality, it is maybe correct to state that the hunting theme was added to the graffito to underline once more the connection between the Buyids and the Sasanians. This would match the process of Iranization that started and developed particulary after 390/1000 ca. when Buyids “reverted […] to the conscious awareness of their Iranian heritage, and Western Iran now embarked on the same process which had previously reached such remarkable proportion in the East, namely the deliberate transformation of its Arabic-Islamic culture into a culture specifically Iranian” (Busse, “Iran under the Buyids”, p. 295). S. S. Blair, The Monumental Inscriptions from early Islamic Iran and Transoxiana, Brill, Leiden 1992, pp. 60-62. P.O. Harper, The Royal Hunter: Art of the Sasanian Empire, Asia Society, New York 1978. S. Shaked, “Eschatology i. In Zoroastrianism and Zoroastrian Influence”, in Encyclopædia Iranica, VIII/6, pp. 565-569; available online at http://www.iranicaonline.org/articles/eschatology-i (accessed online at 12 Jan 2015).